The remains of 250 soldiers killed at the Battle of Fromelles in northern France have been recovered after a four-month archaeological operation. The remains from the group burial at Pheasant Wood will be reburied with full military honours at a new military cemetery close to the site. German forces buried the Australian and British soldiers after the 1916 battle. Soldiers from Bristol, Gloucestershire, Warwickshire and Worcestershire were heavily involved in the fighting. 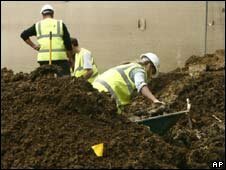 The excavation, which began in May 2008, was carried out by Oxford Archaeology whose final day in the field will be 14 September. DNA samples have been taken from every soldier and specialists in the UK are attempting to extract DNA strands from the samples to help the identification process. The evidence will be presented to a specially convened identification board which is due to meet in March 2010. If the soldiers can be identified their relatives will be able to add a personalised inscription on a headstone at a later date. UK Veterans Minister Kevan Jones said: "This is a milestone in the development of the project and I am grateful for the work that Oxford Archaeology has done. "I know they have been working in very tough conditions and they have recovered the remains of these brave soldiers with the utmost care and respect. "Now we will do everything we can to try to identify each and every one of these fallen soldiers. "What is most important is that these men are laid to rest with full military honours and the dignity they deserve." The minister's Australian counterpart Greg Combet said: "While identification of the remains is an extremely complex process I remain hopeful that we will be able to identify a number of those that we have found."